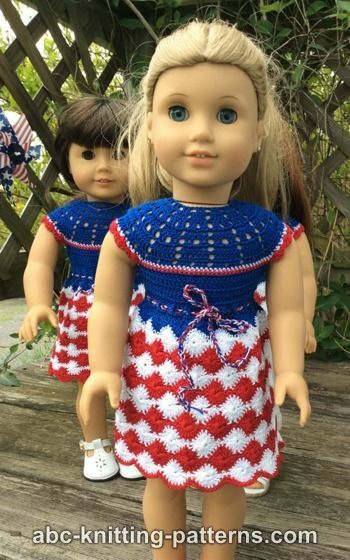 This is the perfect outfit for your doll for the 4th of July, or whenever she is feeling patriotic (or you can crochet it in other colors, for other occasions). 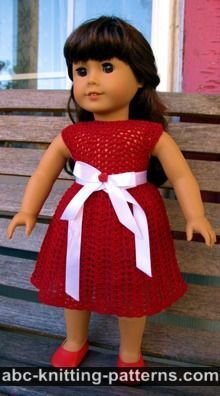 The dress features a circular yoke, a back opening and a belt for fit. It is worked from the top down, side to side at first, then in rounds. 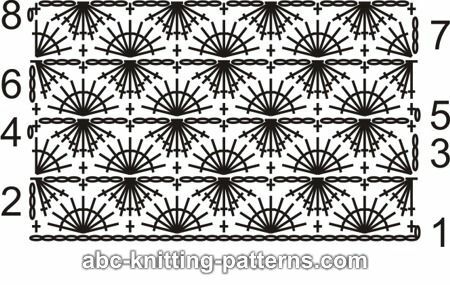 The skirt features a traditional Catherine Wheel motif that I worked in red and white. I used snaps for a closure, but buttons would work too. Metallic or plastic sew-on snaps. Cl (cluster) = work (yo, insert hook, yo, draw loop through, yo, draw through 2 loops) over the indicated number of stitches, yo, draw through all loops on hook. Multiple of 8 plus 1. Row 1 (RS) set-up row: ch 1, 1 sc into the first stitch (dc), *skip 3 dc, 9 dc into next dc, skip 3 dc, 1 sc into next dc, rep from * to end, turn. Row 2 : ch 3 (counts as 1 dc), 1 Cl over next 4 dc, *ch 3, 1 sc into the next dc, ch 3, Cl over the next 9 sts - rep from * ending with ch 3, 1 CL over next 5 sts, turn. Row 3: ch 3 (counts as 1 dc), 4 dc into the first st, *skip ch-3-space, 1 sc into the next sc, skip ch-3-space, 9 dc into loop which closed next CL; rep from * ending with skip ch-3-space, 5 dc into the loop which closed CL, turn. Row 4: ch 1, 1 sc in the first st, *ch 3, 1 Cl over the next 9 sts, ch 3, 1 sc into the next sc, - rep from * ending with 1 sc into last st, turn. Row 5: ch 1, 1 sc into the first sc, *skip ch-3-space, 9 dc into loop which closed CL, skip ch-3-space, 1 sc into the next sc - rep from * to the end, turn. The dress is worked top-down side-to-side to the hip line, leaving an opening at the back. Then, you can either continue in rows, or in rounds, turning at the end of each round. The groups of 2 dc in the beginning and 2 dc at the end of each row on the yoke form a button band. Row 5: ch 3 (counts as 1 dc), 1 dc in the next dc, *ch 1 over ch-1-space, 1 dc in each of the next 2 dc, ch 1, skip the next dc, 1 dc in each of the next 2 dc - repeat from * to the last 3 sts, ch 1 over ch-1-space, 1 dc in each of the last 2 dc. Turn. Row 6: ch 3 (counts as 1 dc), 1 dc in the next dc, *ch 1 over ch-1-space, 1 dc in each of the next 2 dc, 2 dc in ch-1-space, 1 dc in each of the next 2 dc - repeat from * to the last 3 sts, ch 1 over ch-1-space, 1 dc in each of the last 2 dc. Turn. Row 7: ch 3 (counts as 1 dc), 1 dc in the next dc, *ch 1 over ch-1-space, 1 dc in each of the next 6 dc - repeat from * to the last 3 sts, ch 1 over ch-1-space, 1 dc in each of the last 2 dc. Turn. Row 8: ch 3 (counts as 1 dc), 1 dc in the next dc, *ch 1 over ch-1-space, 1 dc in each of the next 3 dc, ch 1, 1 dc in each of the next 3 dc - repeat from * to the last 3 sts, ch 1 over ch-1-space, 1 dc in each of the last 2 dc. Turn. Row 10: with red thread, back: ch 2 (counts as 1 sc), 1 sc in each of the next 17 sc, work sleeve edge over the next 23 sc: *skip the next sc, 4 dc in the next sc, skip the next sc, 1 sc in the next sc - repeat from * 6 times, for the front of the dress: 1 sc in each of the next 35 sc, work the sleeve edge over the next 23 sc: *skip the next sc, 4 dc in the next sc, skip the next sc, 1 sc in the next sc - repeat from * 6 times, back: 1 sc in each of the next 18 sc. Turn. Row 16 (eyelet or belt row): ch 3 (counts as 1 dc), 1 dc in the next dc, *ch 1, skip 1 dc, 1 dc in the next dc - repeat from *, end with 1 dc in the last dc. Turn. Row 19 (RS) : with blue thread, start working the first row of the Catherine Wheel pattern as described above. Turn. 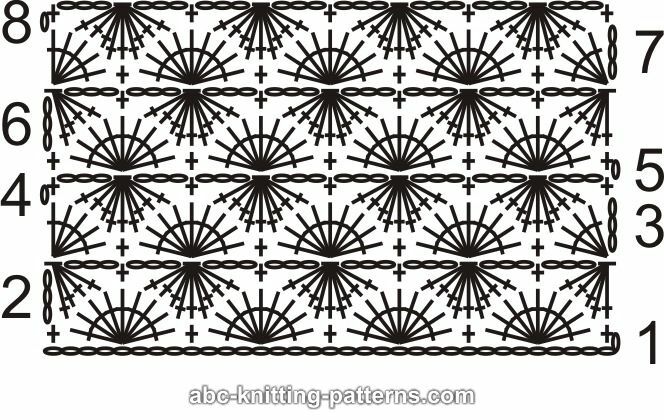 The rest of the skirt is worked in a Catherine Wheel pattern, changing the color sequence every 2 rows. 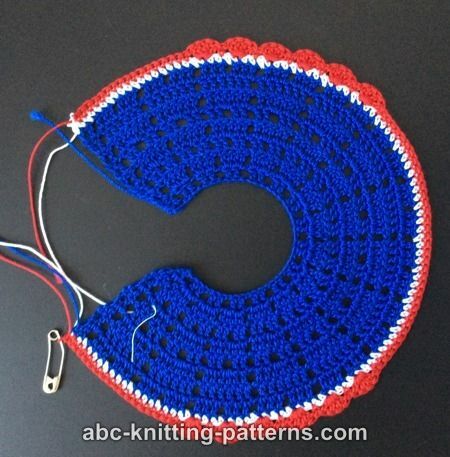 Work 20 rows of the pattern or to desired length. 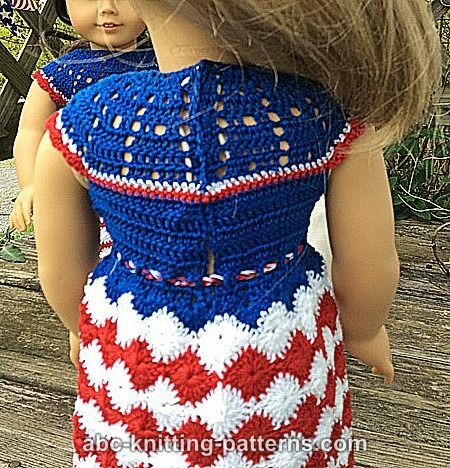 For the tunic, work 9 rows of the pattern. 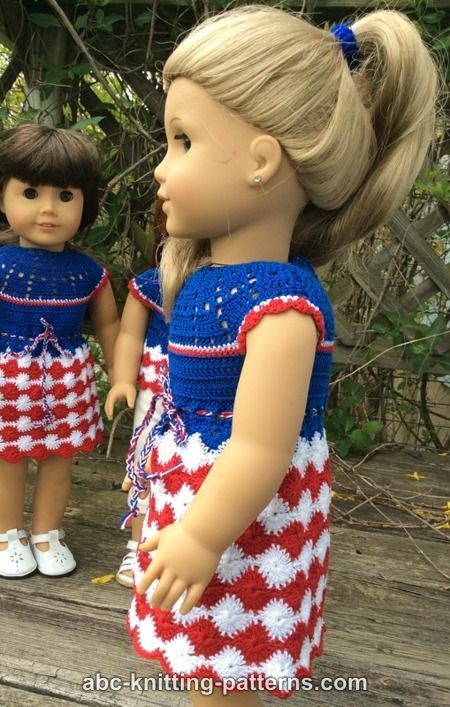 If you’re making the dress, after you work the first 5 rows of the pattern, you can join and continue in rounds, or go on in rows and then sew together last 16 rows. 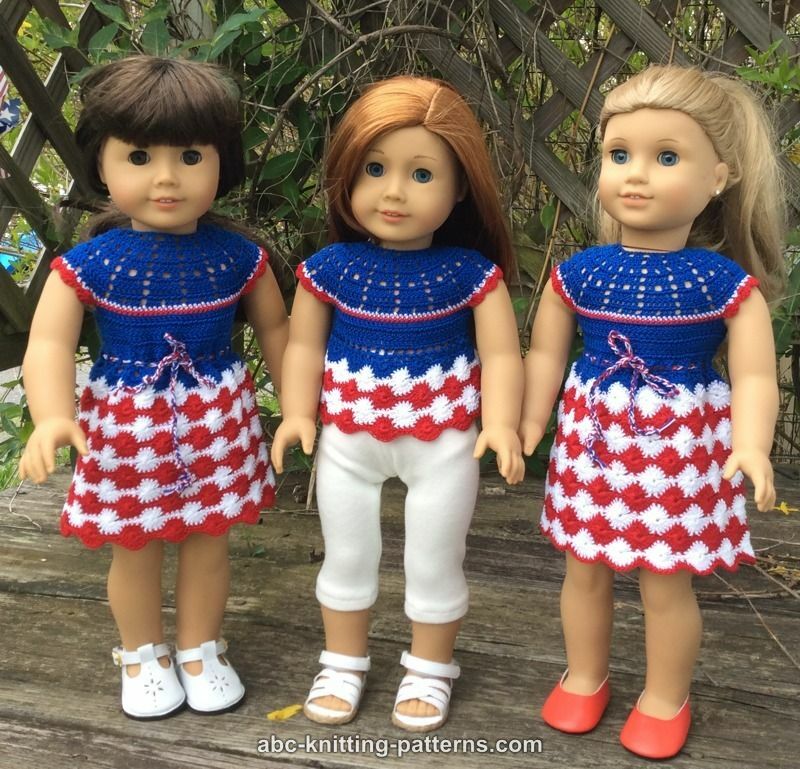 Take a 2.25 mm hook, 3 strands of thread (red, white and blue) and chain a string 15-16" long. Tie the ends. Weave in the ends of threads; insert the belt into the belt row. Sew snaps on the blouse's back. 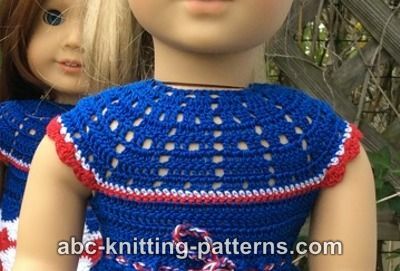 If you make 9 rows of the Katherine Wheel11 pattern, you will have a tunic. 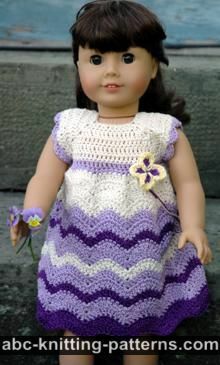 If you make all rows, you will have a dress. 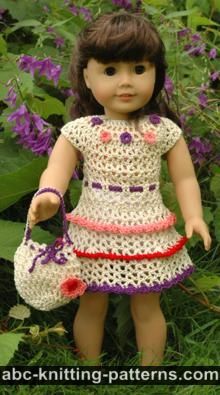 i really do like your patterns, the instructions are very clear... i am not an expert crocheter but i can understand what to do with very little frogging... thanks for making them available.